The tres chic Sheika Mozah bint Nasser Al Missned looked ravishing in a ivory maxi dress when she accompanied her husband, the Emir of the State of Qatar on a state visit to Spain this week. Although the origin of this dress is still unknown to us, we are loving this sophisticated look that she finished off with a matching turban and blazer thrown over her shoulders in the same creamy hue. The monochromatic feel was stylishly broken with the addition of a belt and clutch in a summery tan color. The Sheika, who is a regular on all the best dressed lists, happens to be invited to the royal wedding on Friday and we can't wait to see what glamorous frock she will sport that day! 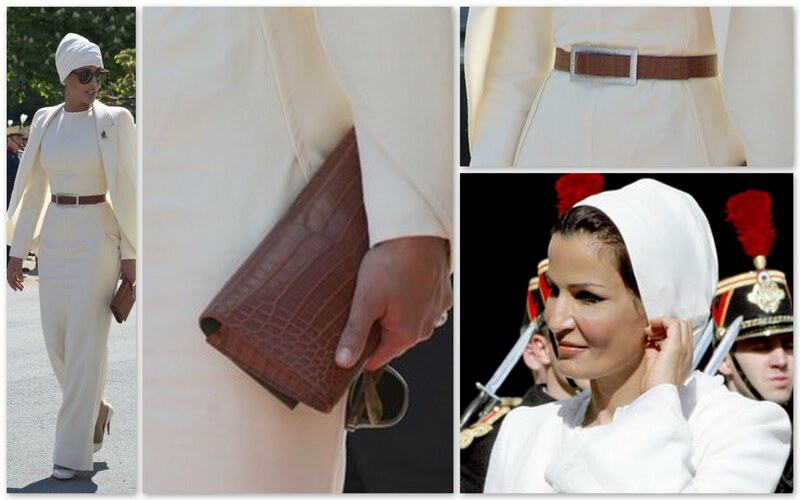 What do you think of Sheika Mozah bint Nasser Al Missned's Look of the Day? She looks so chic and sophisticated! Only a very beautiful woman could pull this look off....and she does it well.